2008 crisis: Worse than the Great Depression? 2008: Worse than the Great Depression? His statement is raising eyebrows. While the "Great Recession" was scary, there's a reason it wasn't dubbed a depression: Bernanke's aggressive policy response. "Arguably the financial shocks of 2008 were bigger than those of 1929. The outcome was not as disastrous because the policy responses were quite different," said Jeffrey Shafer, a former Federal Reserve and Treasury official. The response to 2008 was spearheaded by Bernanke, who has studied and written extensively about the Great Depression and the policy blunders that exacerbated an already bad situation. His surprising comment surfaced last week in a court document related to the AIG (AIG) bailout. 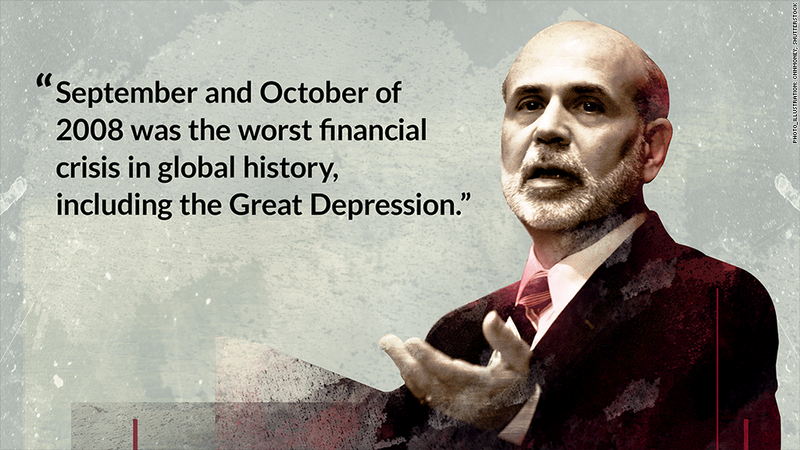 "September and October of 2008 was the worst financial crisis in global history, including the Great Depression," court documents filed on August 22 quote Bernanke as saying. While those remarks are receiving attention now, including from The Wall Street Journal, they actually aren't new. They appear to be pulled from confidential testimony Bernanke made to the Financial Crisis Inquiry Commission in November 2009. That testimony was later included in FCIC's 662-page report, which was released to the public in January 2011. It didn't get much attention from the media or economists at the time. Related: Why hasn't Main Street recovered like Wall Street? Depression vs. Recession: "My guess is he meant it was the most complex and widespread deterioration of financial markets," said Mark Gertler, a New York University economist who has written several papers with Bernanke. "I don't think he had in mind that the Great Depression was milder than the Great Recession." That much is clear. During the Great Depression, unemployment spiked to 25%, and the country's output plummeted by nearly 50%. At its peak, the unemployment rate never climbed above 10% during the Great Recession. That was the highest rate since the early 1980s, but nearly as bad as the 1930s. "It would be outrageous to say it was a bigger crisis overall, but you could make the case that the shocks were as great," said Shafer. Complete collapse in confidence: That seems to be Bernanke's point. In his 2009 interview, Bernanke noted that 12 of the most important financial institutions in the U.S. "were at risk of failure within a period of a week or two." Countless overseas banking giants also needed rescues to prevent bankruptcy. Following the collapse of Lehman Brothers, there was a complete collapse in market confidence. Even companies like General Electric (GE) were struggling to find the funds needed to keep their businesses operating. "The solvency of the whole banking system was in question. This was a crisis that went beyond anything that our academic Fed chair had ever dreamed of," said David Jones, a former Fed economist and author of Understanding Central Banking. Ferocious Fed response: The major difference between the Wall Street crisis and the Great Depression is the way the Fed reacted. While central bankers responded to the 1929 crash timidly and even by tightening monetary policy, Bernanke's Fed knew better. Bernanke slashed rates lower than they've ever been in the U.S. and then pumped enough liquidity into the system to send the Fed's balance sheet swelling north of $4 trillion today, compared with less than $900 billion before the crisis. Fiscal policy was also more aggressive. Congress eventually approved the $700 billion TARP bank bailout followed by the $831 billion stimulus package in 2009. "I think that it is fair to say that if the Fed and Treasury had done nothing and there had been no TARP to give them new tools, we could have been looking at a disaster that surpassed 1929-33," said Shafer. Economists may spend decades debating whether the Great Depression or the 2008 crisis was scarier. Few have the vantage point of Bernanke, who spent his academic career studying the former and lived through the latter. "It's a judgment call since none of us were in the Great Depression. But if anyone can make that call, it's Bernanke," said Jones.